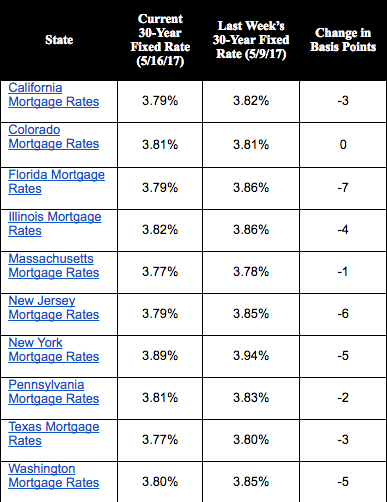 The 30-year fixed mortgage rate on Zillow Mortgages is currently 3.80 percent, down four basis points from this time last week. 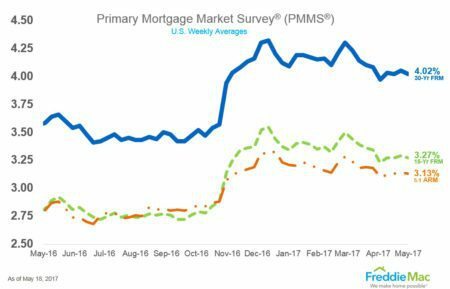 The 30-year fixed mortgage rate inched higher last week before falling near current levels on Friday. The average number of Days on Market declined for the third consecutive month and April’s 57 days set a new low for April in the report’s nine-year history. Months Supply of Inventory, which dropped below 3 months in March for the first time in the report’s history, was 2.8. A months supply of less than 6.0 is considered a seller’s market. Inventory was down 17.6 percent from April 2016. This is the 102nd consecutive month of year-over-year declines dating back to October 2008. Builder confidence in the market for newly-built single-family homes rose two points in May to a level of 70 on the National Association of Home Builders/Wells Fargo Housing Market Index (HMI). This is the second highest HMI reading since the downturn. “This report shows that builders’ optimism in the housing market is solidifying, even as they deal with higher building material costs and shortages of lots and labor,” said NAHB Chairman Granger MacDonald, a home builder and developer from Kerrville, Texas, in a news release.